A week ago I saw a Tufted Titmouse on the ground hopping around with a wing hanging down. Oh no! I'm such a whimp when it comes to injured wildlife. I've taken so many little critters to The Wildlife Center for restoration, only to find out that it cannot be helped. But this was just a broken wing, so I knew I would get to return for it and release it back to the woods behind us. Well ... it didn't turn out that way. The wing was broken at the joint and that wasn't a break that could be repaired, so it was euthanized. I was 100% sure it would be okay, so it was quite a blow to be told it was already dead. It took me the week to get over it. I kept seeing those tiny black eyes looking at me as I told him was going to be okay. I lied! I thought I was telling 100% truth, but it turned out to be a lie. Randal and I have been in a season of life where God has us going through our Truth and Lie files. We all have them. The sum total of what's in those two boxes regarding God is how we see Him and what we believe about Him. Sadly, many have turned their backs on God because they saw the wrong picture from what they filed into their Truth box. We've been amazed at how much we had filed in the Truth box that was misfiled. I Corinthians 10:12 tells us that those who think they are standing firmly should be careful that they don't fall and Philippians 1:6 says we are to be confident of one thing ... He who has begun a good work in us will carry it on to completion. Praise God for His faithfulness! Yesterday and today I've been able to have the doors and windows open all day and night and I even slept outside on the screened porch the past two nights ... at least for part of the night until it got too chilly. What a delightful break in the official summertime. Central Virginia has wonderful weather for 7 months of the year ... it's the 5 months of bone chilling that I don't handle too well with the rheumatoid arthritis. 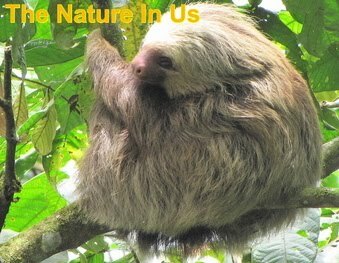 That's when I'd like to head for Costa Rica's jungles and forget all about winter. I reviewed a video of Mantled Howler Monkeys that I took last year. Actually it's a video I made up from a lot of videos with my Apple iMovie feature. I really love howler monkeys ... or I wouldn't have bothered with the techie software to get the job done. 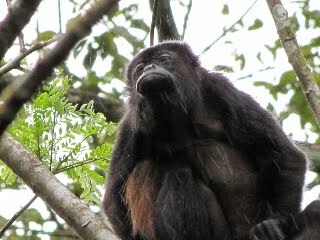 But now it's on the website and you can view the video of "my" howler monkeys. 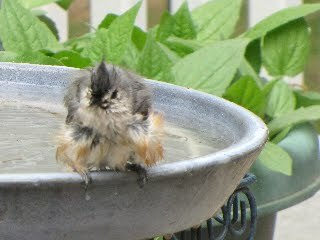 I've also added to my backyard photo albums for critters and garden. View Critters. View Garden. Until next time ... make every day a blessed day! visit Manage Your Subscription on the website.